I cannot overstate my love of Sarah Maas. ACOTAR was fun, but Throne of Glass is where my heart's at. It killed me a little when they announced there wouldn't be ARCs. The whole Grisha trilogy amazed and inspired me. Leigh writes like a painter, and her plots are thrilling. I'm really excited to return to her world. Chaos Walking was a cheeky, funny series with a decent amount of darkness. His characters are so heartfelt. I love the idea of the not-the-Chosen-One theme. A.S. King is amazing. Her books are always innovative, emotional, and written with a gravity that's hard to find in YA. I'd read a napkin if she wrote on it. It's a book written in memos, transcripts, and redacted statements. I'm not sure how well it'll work, but I'm impressed that they're trying something crazy and new. One thing YA needs more of is good horror. I've yet to come across one that's truly chilling, not since The Unquiet by Jeannine Garsee. I've got high hopes for this one. I haven't disliked anything by Cat Winters yet. I don't think it's possible. Her supernatural historical romances are just the right mix of mystery and swoons. Oh, how I love this series! It has the charm of Harry Potter, but it stands well on its own. Callum is great, and I need to know what happened after that ending! I'm always down for a good fantasy. Not only has this one gotten some good hype, but I'm insanely intrigued by this "Game of Fives" thing. I loved The Jewel, which I got at BEA last year. It didn't get nearly enough cred. I'm psyched to see what's next for Violet! Great list! I'm really excited about Six of Crows and Queen of Shadows as well! They're going to be epic! The White Rose looks wonderful! I am excited for Queen of Shadows. I completely managed to forget about Six of Crows. I should have had that on my list too. My TTT! Oh go, I'm kind of jealous. I wish I could read it for the first time again. SO FREAKING GOOD. Hiya CJ! I've started the Throne of Glass books this year and I'm excited to read on :-) I also like the sound of Six of Crows- I keep seeing it everywhere haha! I hope you enjoy all of these :-) I'm a new follower too! Here's my TTT if you would like to check it out :-) Have a great day! I'm excited for The Rest Of Us Just Live Here, I've never seen that cover though, can't decided which I love more now! The Court of Fives didn't make my list this week but it is in my TBR and I am ridiculous excited for it. Love fantasy and this one looks so good, I'm also totally intrigued! I Crawl Through It looks intense and totally emotional but that is what I love in my books. This one is going on my TBR list right now! Thanks for putting it on your list! :) Happy Reading! I think this is the American cover. I agree completely about CoF and ICTI! A.S. King is one of my favorites. I hope you enjoy it! Queen of Shadows and Six of Crows are on my list too, I cannot wait for them to be released! Great choices, there are so many fantastic books coming out in the next few months! I know! Then in September, it's like a deluge. I still haven't read Cress because I'm a bad person, but I'm sure Winter will be great. Ooh, I didn't see the giveaway. I have a copy but I'll definitely spread the word. The Rest of Us Just Live Here sounds awesome! 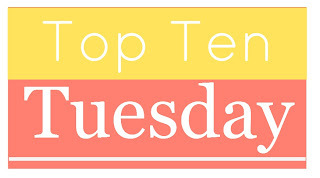 Check out my TTT and my Top Ten Favorite Characters Tag. Anything written by Leigh Bardugo is something I NEED. So yeah, gonna add that one to the ever growing TBR straight away! Great list! I also can't wait for The Rest of Us Just Live Here!! I'm so glad that this book is getting a lot of love! Great list! I can't wait for Illuminae. I'm so jealous of everyone who has the hardcover arcs of it.